The producers of the show Columbo never revealed the first name. I think the author of a trivia book (Fred Worth) inserted a first name for Columbo that he made up to twart would-be people who stole information from his work. Trivial Pursuit creators used this information in early editions, but later removed it when it was found they took the infomation from Fred's Book. Thank You Elisa, I appreciate your comment. seeing this question, I googled and am copy- paste this tidbit. Columbo's first name is never explicitly revealed in the series. However, whenColumbo flashes his badge in the episode "Dead Weight" (Season 1 Episode 3), thename 'Frank' can clearly be seen on his ID. In the german DUB befriended police detectives occasionally call him Frank. Don't think his first name was ever revealed, just like "the wife" or "the missus" was never named or seen. Catch him doing the Columbo character at Dean Martin's roast of Frank Sinatra. It's on YouTube and it's hysterical. Thank You so much for posting Peter Falk. 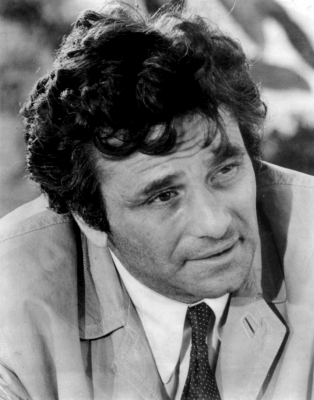 I would like to ask if anyone knows if Peter Falk's Charcter Columbo had a first name.